The reality is they are using it and we have to start directing our concern from how much they’re using it to what they are doing with these media and then what context they’re doing it because so many schools, so many of our communities are now building themselves around a technology that is able to facilitate those activities, that the concept of screen time is really obsolete. This tip sheet from The Center on Media and Child Health offers pointers for parents on raising healthy, productive digital natives organized by health outcomes, child developmental stages, and media of concern. Fred Rogers Center Initiative On Digital Media And Learning: A facet of the Fred Rogers Center that deals with how media and technologies can be used effectively to enhance children’s cognitive and social abilities. Using Screen Media With Young Children: A range of ways you can use screen media to make it an interactive, more enriching learning experience. 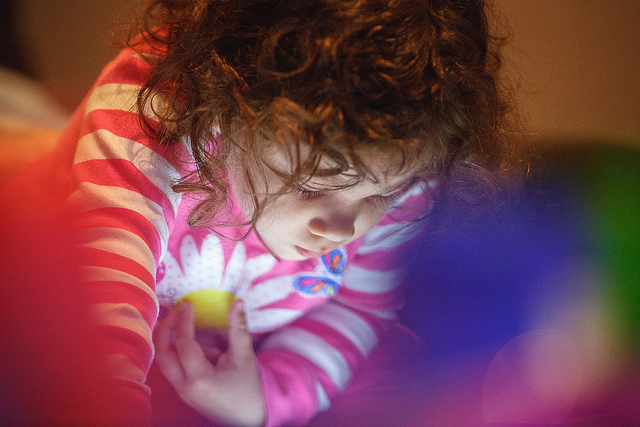 Research-Based Guidelines for Screen Use for Children Under 3 Years Old: A resource for parents and caregivers of young children on how to use screens in ways that minimize the potential negative effects and maximize learning. A Guide To Managing Media For Teens and Tweens: More than ever before, tweens and teens are watching, reading, listening, creating, and communicating throughout their entire day. It’s become harder to distinguish between screen time and just … time. Common Sense Digital Glossary: Not sure how to decode your teens’ shorthand in the digital world? Feel like you need to brush up on the latest digital apps? Still think that MySpace is the right space? This digital glossary will help parents and educators better understand what their kids already know about the digital world. Pause & Think Online: This video and song is for kids ages 5 to 9. Using verses and characters based on familiar body parts, the song and video help kids make the connection that safe, responsible, and respectful behavior online is a lot like behaving safely, responsibly, and respectfully in the offline world. Tap, Click, Read: The homepage for Guernsey’s and co-author Michael H. Levine’s new book, with links to articles and studies on early literacy and technology, plus video examples from communities around the country. How True Are Our Assumptions About Screen Time? Published by NAEYC Families, a publication of the National Association for the Education of Young Children, this article tackles five big questions from parents. What questions do you still have? Leave us a comment.